The Orkney Islands possess a wealth of Stone Age monuments, many of which have only been uncovered recently, with many more remaining buried or still in the process of being excavated. One of the few Stone Age monuments that have been a feature of the landscape throughout many thousands of years is the Ring of Brodgar stone circle, which, at approximately 5,000 years old, pre-dates both Stonehenge and the Pyramids of Egypt. The stone circle lies in the West Mainland of Orkney, and is in the heart of Neolithic Orkney, a world heritage site. I have seen numerous excellent photographs of these stones, most of which were taken in daylight; however, I have been keen to capture something different and have been thinking about shooting the stones at night-time under clear, starlit skies. And so I have been waiting patiently for some time for the right conditions for creating star trails: a clear, moonlit night, light winds, and little or no mist or fog. I have attempted in the past to capture star trails – mostly without success, since either cloudy skies have thwarted me or I have failed to disable the camera’s long-exposure noise reduction feature, which has produced star trails with gaps in them in the final image. These gaps are due to each long exposure being followed by an additional long blank exposure, which is a feature of my camera's long-exposure noise reduction facility. 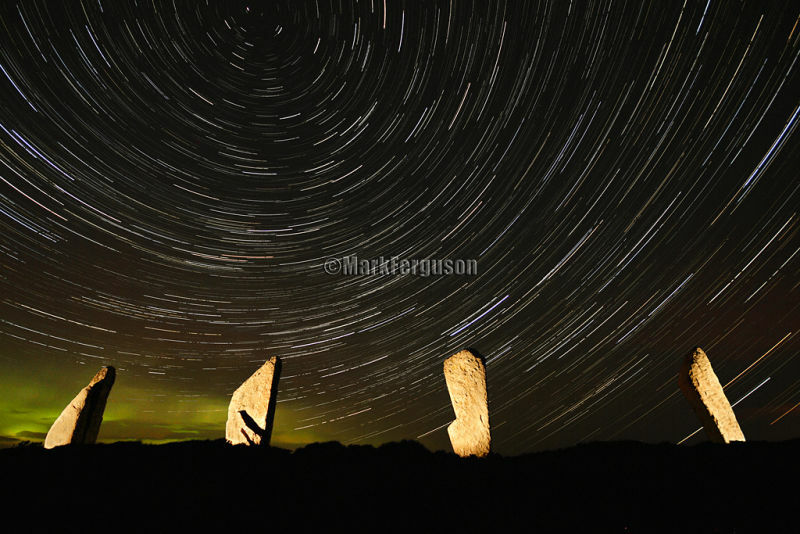 To be honest, I was unaware of this unwanted in-camera feature; and, ever since these failed attempts, I have been even keener to visit the Ring of Brodgar on a clear winter’s night to try a similar exposure – but this time without using the camera's noise reduction facility. One such opportunity arose in March of this year; and on that occasion I was even hopeful of seeing an aurora since I was aware that activity had been high for a few nights previously. Armed with my camera, tripod and torch, I drove the short distance from my home to the Ring of Brodgar and set up my tripod and camera in the surrounding ditch. I decided on a composition that included four stones, plenty of sky and, crucially, the Pole Star, which would act as a focal point for the final image. I used the following settings on my Canon 7D: manual exposure, f5.6 at 30 secs, iso 400 and continuous exposures. Having pre-focussed at about 2m using the 10mm end of my Sigma 10-20mm lens I then locked the remote release, let the camera do its thing for the next 55 minutes, and walked around the stone circle to pass the time while I waited. After approximately 20 minutes, I began to notice a faint aurora developing to the north and was content in the knowledge that my Canon 7D would be capturing this glow in the northern sky. The aurora glow was weak and intermittent but I hoped that there was sufficient brightness for a 30 sec exposure to pick it up. After another 20 minutes or so, and having returned to my camera, I decided to illuminate the four stones with my torch. This can be a tricky skill to master, as it is easy to overexpose the stones. But through trial and error I have learnt to err on the short side when illuminating – the highlights on the stones can always be brought out in post-processing, whereas overexposed highlights would be difficult to pull back later. After about 55 minutes, for the final 30 second exposure, I placed the lens cap on the end of the lens. This effectively produced a dark frame for use in post-processing to reduce the noise in the image. Post-processing involved using a dedicated software blending program and Photoshop. I used curves to accentuate the startrails and the aurora slightly, and performed some simple cloning to even-out some overexposed sections of the stones. I was pleased with the continuous startrails and the faint greenish aurora glow, which I felt was very realistic. Ironically, I believe a brighter aurora would have proved more difficult to expose for, and could have produced a washed-out, overexposed sky.